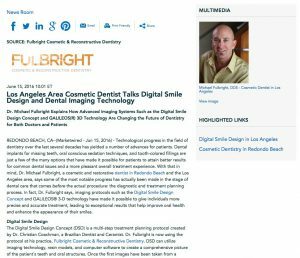 Dr. Michael Fulbright explains how advanced imaging systems such as the Digital Smile Design Concept and GALILEOS® 3D technology are changing the future of dentistry for both doctors and patients. Redondo Beach, CA – Technological progress in the field of dentistry over the last several decades has yielded a number of advances for patients. Dental implants for missing teeth, oral conscious sedation techniques, and tooth-colored fillings are just a few of the many options that have made it possible for patients to attain better results for common dental issues and a more pleasant overall treatment experience. With that in mind, Dr. Michael Fulbright, a cosmetic and restorative dentist in Redondo Beach and the Los Angeles area, says some of the most notable progress has actually been made in the stage of dental care that comes before the actual procedure: the diagnostic and treatment planning process. In fact, Dr. Fulbright says, imaging protocols such as the Digital Smile Design Concept and GALILEOS® 3-D technology have made it possible to give individuals more precise and accurate treatment, leading to exceptional results that help improve oral health and enhance the appearance of their smiles. The Digital Smile Design Concept (DSD) is a multi-step treatment planning protocol created by Dr. Christian Coachman, a Brazilian Dentist and Ceramist. Dr. Fulbright is now using the protocol at his practice, Fulbright Cosmetic & Reconstructive Dentistry. DSD can utilize imaging technology, resin models, and computer software to create a comprehensive picture of the patient’s teeth and oral structures. Once the first images have been taken from a variety of angles, Dr. Fulbright can go over them with the patient and begin incorporating potential outcomes from the treatment he or she desires. The patient can then offer suggestions as to how they want the treatment outcome to look, helping Dr. Fulbright better understand their goals and expectations and modify the model to reflect the patient’s needs. Once the ideal outcome is shown, a resin model is ultimately created to display how the final results will fit the patient’s teeth. Dr. Fulbright says Digital Smile Design can be used for cosmetic bonding, porcelain veneer treatments, and many other reconstructive and cosmetic dentistry procedures. He notes that it is particularly beneficial for patients undergoing a full Smile Makeover, which combines a number of treatments to address an array of dental concerns and completely rejuvenate their smile. Dr. Fulbright explains that DSD ultimately helps individual patients communicate their needs and goals to the dentist utilizing tools that allow them to fully visualize a variety of outcomes and provide feedback. He says this can give patients peace-of-mind that the treatment will be incredibly precise and that their expectations will likely be met – and perhaps even exceeded. Another advanced technology Dr. Fulbright highlights is the GALILEOS® ComfortPLUS system. A diagnostic imaging and planning technology, the GALILEOS® is a CT Scan that takes a 3-D picture of the patient’s skull. Dr. Fulbright says this state-of-the-art technique can be especially beneficial for patients who are considering dental implants, allowing him to merge the data with planning software and create an incredibly detailed treatment process. He notes that these tools enable him to choose the precise angle and length for implant placement in order to reduce risks and create results with the most accurate fit and natural look and feel possible. Overall, Dr. Fulbright says new dental technologies can make treatment faster and more efficient, while significantly increasing the potential that outcomes will be satisfactory for patients. He says these advanced techniques have an impact on virtually all stages of treatment, giving patients even more reasons to smile after they’ve left the office. A sustaining member of the American Academy of Cosmetic Dentistry, Dr. Michael Fulbright is also a member of the American Dental Association, the American Academy of Implant Dentistry, the American Academy of Dental Sleep Medicine, and the West Los Angeles Dental Society. He earned his Doctorate of Dental Surgery at the USC School of Dentistry, and attained continuing dental education at UCLA’s Advanced Aesthetic Continuum and the Pacific Implant Institute. Fulbright Cosmetic & Reconstructive Dentistry offers a comprehensive array of general, cosmetic, and restorative dental treatments, including porcelain veneers, teeth whitening, dental implants, and other options. In addition, the practice offers an expansive sleep apnea diagnosis and treatment program for both adults and children, as well as TMJ treatment and orthodontic procedures. Dr. Fulbright is available for interview upon request. For more information about Dr. Fulbright and his practice, visit fulbrightdental.com or facebook.com/FulbrightDental.